The heart and soul of every city in the world can be found in one place: Downtown. This is where the magic happens, where the action is. Las Vegas is no different. If you find yourself tired of the gaudy neon lights of the Strip and worn out by the tourist decadence of the casinos, we suggest you get in your preferred means of transportation and head North on Las Vegas Blvd. When you see you a giant neon cowboy waving at you, you’ll know you’ve arrived! And you’re in luck, as we’ve curated the best places for you to visit. Take your pizza to the next level! 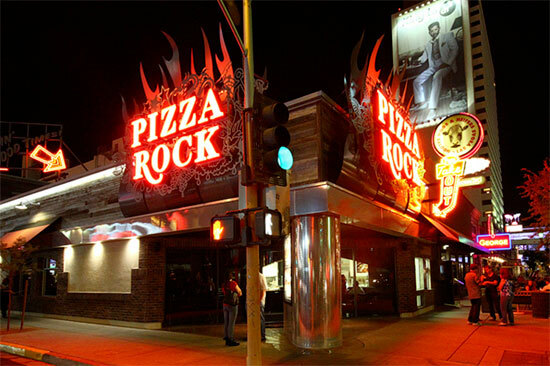 Pizza Rock is not your traditional pizzeria. Here, artisanal techniques are imbued with the energy of the nightlife to give birth to creative gourmet pizzas! This is the only place that you’ll find honey malted guinness beer dough or homemade sorghum four roses bourbon BBQ sauce. And with over 30 craft beers as well as hand-crafted artisan cocktails, you’ve got the recipe for a night you won’t soon forget. 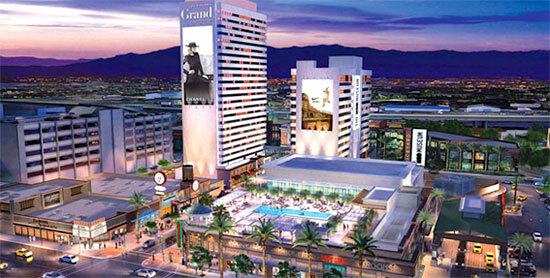 An ode to the classic Vegas Vibe, the Grand Hotel possesses a unique decor that can only be called industrial chic. This hotel is a step away from everything in downtown Las Vegas, where you can get a taste for the historic feel and a taste of the local culture. The struggle between the Mafia and the law is an important part of the American zeitgeist. The Mob Museum is where you can learn the real stories and actual events of Mob history in Las Vegas via interactive and engaging exhibits. Located inside the old Las Vegas courthouse, the Museum provides an interactive journey that will take you from the birth of the Mob all the way to the headlines of today. And with provocative multi-sensory exhibits and unparalleled insight, the story of the Mob will come to life before your very eyes. A truly unique place in Downtown Las Vegas. 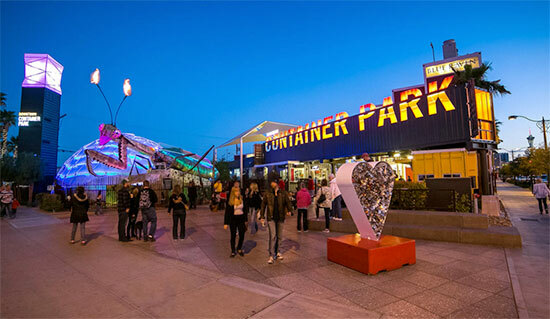 This outdoor shopping, dining, and entertainment venue is made up completely of shipping containers! They have been stacked one on top of the other to create an eclectic offering of boutique shops and food outlets. And you won’t have any trouble finding the place, as it’s guarded by a giant metal fire spittin praying mantis. No, I’m not kidding, this unique art piece was brought in from Burning Man to welcome all visitors. Amidst empty sockets and rusted metal life remains. 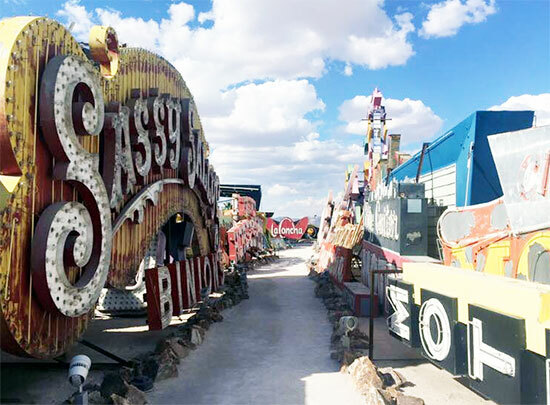 The Neon Museum is an institution that seeks to preserve and celebrate Las Vegas’ most distinctive landmarks; the neon sign. Portents that once lit the sky have now been grounded. You can walk amidst these vintage beauties and admire their deliberate and self-acknowledged theatricality. They are both art and performance. Gaudy and ostentatious and oh so very Vegas! This is where independent coffee, vinyl, handcrafted food, great beer and wine come together! A unique and quirky coffee shop, The Beat is located on the ground floor of the Emergency Arts center. This place is often frequented by local musicians and artists, which may bring you back to the grunge scene of the early 1990s. There’s also a little art gallery as well as a vinyl collection where browsing is not only permitted but also encouraged. Jump off from the world’s largest slot machine! Yes, you heard that right. The SlotZilla zip line in the heart of downtown allows you to fly along zip lines over Fremont Street. But that’s not all. You’ll be entranced by the 12.5 million lights and 550,000 watts of sound of the Viva Vision canopy of the Fremont Street Experience. This is an exclusive zone of 18 blocks set aside for local art and artists. Also known as the 18b, it’s an eclectic mix of art galleries, one of a kind stores, restaurants, bars and theatre spaces. It’s also home to the “First Friday” Art Walk, an arts and cultural event that draws up to 30,000 on the first Friday evening of each month. This is the perfect place to browse, buy, eat, drink and mingle amongst locals, artists, and artisans. A casual neighborhood lounge with character. On any given night you can see bands perform, get your groove on in a dedicated dance area, chill out on the sofas in the back section or sit up close at the bar. The bartenders are knowledgeable and friendly, with an offering of delicious drinks, boutique wines and eclectic beers. The walls are decorated with paintings and photographs by local and international artists. And with signature drinks like The Warhol, Taming of the Shrew, and Nicky Free, you know you can’t go wrong. 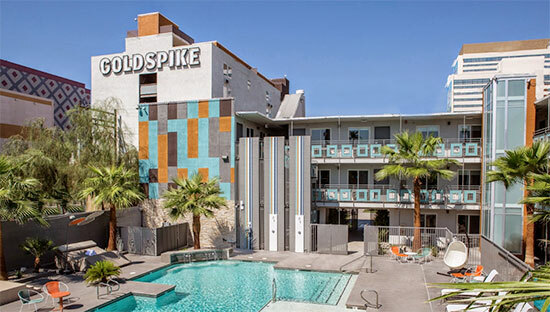 Oasis at Gold Spike is a boutique hotel in the heart of Downtown Las Vegas. The architectural style is reminiscent of the city’s mid-century vernacular and it features individually designed rooms, where each visit can becomes the site of a new adventure. Right next door to the Oasis is the Gold Spike, an old school casino retrofitted for good times. You won’t find any slot machines or poker tables here. Instead, you’ll come across a giant Jenga and Connect Four, an over sized Beer Pong and a Foursquare – all guaranteed to bring the competitive kid (ahem, adult) out in everyone! Downtown Las Vegas is home to a unique vibe you just won’t find on the Strip. If you’re channeling your inner Nicolas Cage and looking to leave Las Vegas or just tired of the knockoff Venice and Paris and New York, that’s when you come to downtown.